"What are you doing?" asked City Dog. "Waiting for a friend," replied Country Frog with a smile. "But you'll do." We're in frog mode this week, hopping and croaking and reading frog books. It all started after bringing home a new Mo Willems' book from the library. I hadn't read any reviews of City Dog, Country Frog before bringing it home from the library to read with my kids. When I see a book by author, Mo Willems, I snap it up without thinking twice and anticipate a fun, lighthearted read. 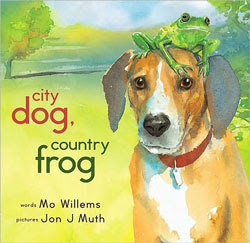 However, with City Dog, Country Frog, Willems takes a completely different direction. Touching, poignant, bittersweet - those are the words that have been used to describe the story about friendship between two unlikely friends, a frog and a dog. They meet one spring day and continue to play together through the seasons, teaching each other new games and finding companionship and conversation. Winter arrives and friendships change, but the big froggy smile remains. 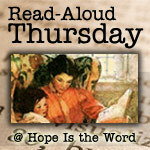 The first time I read the book aloud, my husband was listening in a nearby room. As I finished the book, he walked toward me with a confused, concerned and surprised expression wanting to see the book for himself. It takes a special kind of picture book to get a response from an adult, and this one certainly has that quality. I don't want to say too much, but this book has the power to invoke a deep emotional response in the reader. The passage of time is clearly evident - friendship and loss is dealt with in an original way. The writing is simple, Muth's watercolor illustrations are exceptional. It's a great exploration of friendship and the seasons of life, written in an easy, gentle way for children to interpret in their own way and question. We wanted to create our own frog friends, and decided to make painted rock frogs this week. It's an easy craft for all ages. 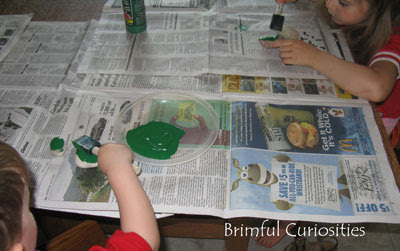 The kids searched for frog shaped rocks outside, colored them green with acrylic paint and added a few yellow speckles (or globs in my toddlers case) for good measure. We found a template online for the feet on ZiggyZoom. I cut out the feet from a sheet of green foam paper. We used Glue Dots to add the wiggly eyes and feet to the body of the frog. We made five frogs in total so we could use them when singing the "Five Green and Speckled Frogs" song. My daughter thinks her frog needs a rock dog friend. We'll have to work on one of those later, and I'll post it if it turns out. This Mo Willems book sounds like a real gem! I'll DEFINITELY have to look for it! Cute frogs! I need to be much more intentional about doing art with my girls. I didn't know of this Willems title but it definitely sounds interesting. AND THE FROGS! I LOVE YOUR FROGS!!! Wow...super frogs! Do the glue dots hold those eyes on well? I love Mo Willems and look forward to reading that book. The frogs are SUPER cute. My kids just washed some rocks yesterday, so maybe they will become frogs. I was so impressed with his handling of the subject. How neat to have a video of the author explaining his story - I can't wait to share it with the kids! How super cute are those frogs!!! We have just got "into" rock painting (we have some blue and orange ones lying aroud) and Red Ted LOVES google eyes. What a great paperweight or decor! Thank you for sharing this really cute craft and book. 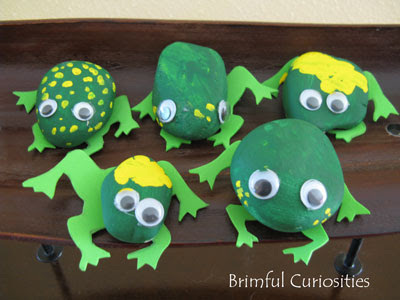 Since Emily LOVES frogs I will definitely have to check out this book and try these cute rock frogs with her. Thank you for linking to stART!!! Those frogs are so cute! I would love for my daughter to make one for my desk! those frogs are way too cute! And I loved the video, thanks for sharing it. I'm sure whenever I read this book I'm going to cry. We love Mo Willems, but this book is completely new to me. I think the frogs turned out awesome - I was just contemplating trying some rock art here too. The book sounds awesome! I'm going to have to look for a copy of it. And those frogs are adorable! I'm totally borrowing the idea! And I bookmarked the template too...thanks for sharing!! I want to thank you. I teach middle school and my children are grown. However, I rely on your blog to provide me with quality books and ideas for my grandkids. It was different when I taught K-5 and was in the loop. You and your site are a wealth of information and ideas. Thank you for such a quality blog. Those frogs are just the cutest. What an awesome summer project. We are at the lake for next few weeks so I need to send boys to look for rocks.